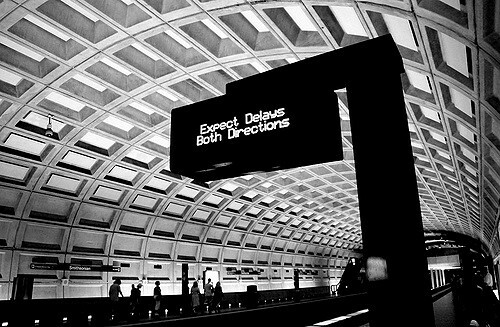 “Metro is advising customers on the Orange, Silver and Blue lines of a service disruption that will impact travel during the afternoon/evening commute. Due to defective rail fasteners in the area of Smithsonian Station, all Orange and Blue line trains will share a single track between Federal Center SW and Smithsonian stations. The issue was identified by Metro inspectors during a routine track walk. Orange and Blue line trains will be subject to delays of 20-40 minutes during this evening’s rush hour as rail traffic alternates through the affected area. Customers on these lines may experience significantly longer waits and crowding on platforms and trains. Riders traveling between DC and Orange Line stations in Arlington may consider Metrobus 38B service as an alternate. All Silver Line trains will operate between Ballston and Wiehle-Reston East only to reduce congestion. Riders traveling to Silver Line stations in Virginia should use the Orange Line to travel between DC and Ballston. Customers traveling to/from Virginia stations south of Pentagon should consider the Yellow Line as an alternate to the Blue Line.